It is hardly surprising to find coloured grounds on the early Yangzhou-enamelled glass wares, since they were inspired by court designs and executed to imperial orders; they reflect a trend at court in the second half of the Qianlong period for using pre-existing plain coloured glass bottles for enamelling. Among the more common colours for the grounds on enamelled glass bottles attributable to Yangzhou is turquoise-blue. The shape of this bottle is a rare one for the school, and the matching original stopper is even rarer. Such matching stoppers, however, are not unknown on other enamelled glass wares from the second half of the Qianlong reign. Examples are given in the commentary on this bottle in Treasury 6. 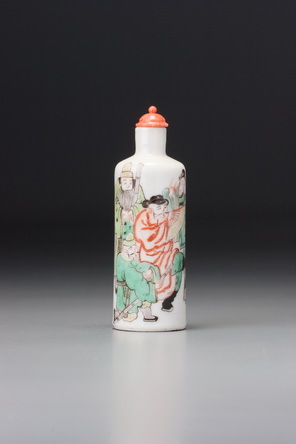 Many original stoppers may have since gone missing or been broken and replaced, but there seems to have been a trend during the early phase of production at Yangzhou towards providing at least some enamelled glass bottles with matching stoppers. Although we can be certain that the reign mark was originally enamelled in iron-red, it has since worn off, leaving only the effect of the enamel where it has etched the blue glass beneath. The mark is clearly visible, but no colour remains. We can assume that it was very pale to begin with, since the bottle itself is relatively unworn and the reign mark is protected by a protruding footrim. It is possible that a later owner, seeing how faint the mark was and being influenced by a prevailing belief that these wares were nineteenth-century copies, decided it would be better without it. If he had it removed, he must have been unaware of the clear impression permanently etched beneath the colour.